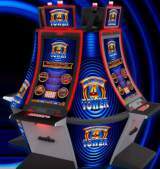 Wonder 4 Tower © 2016 Aristocrat Leisure Industries Pty, Ltd.
A new concept to the Wonder 4 brand, Wonder 4 Tower offers a new presentation of game play with vertically stacked reel sets. Choose among player favorites like Buffalo, 5 Dragons, Wicked Winnings II, and Pompeii. Players have the opportunity to win a new version of the Super Free Games Feature. To start, two of the six reel set windows (triggering theme) are unlocked. The player starts playing in the initial windows and has the potential to unlock up to all six windows. Once all six windows are unlocked, excitement is increased with the possibility of multipliers added to any of the windows.